Monday, October 15th, 2012 . Spreading your nasty germs around the office is a great way to upset your coworkers. But for some reason people still come into work when sick. They may just not have the time off, feel obligated to be there for the big meeting or perhaps just can’t get enough of their cubicle?…Whatever the reason, don’t be that guy/gal! You can still get your work done, rock the big meeting and keep everyone else happy with the mighty power of today’s conference calling technology. ÜberConference (obvi) – our free conference call tool provides the audio solution for your meeting as well as the visuals so you know who’s saying what on the call. GoogleDocs or Box.net both let you share your PowerPoint or other presentation documents with your coworkers. For note-taking and audio-saving capabilities, well, we DO integrate with Evernote so that one is an obvious choice. What we’re saying here is that there is ZERO need to come in. So stay home, rest up, take some zinc and still get your work done. Talk it over with your boss or coworkers if you have to, but if they care anything about their own health, they’ll likely thank you forconferencing it in. Friday, October 12th, 2012 . Get your own ÜberURL to see all of your calls! One of the great things about ÜberConference is that you can see who’s on the conference call and who’s talking at any given moment. For instance, the person speaking during your call shows up at the top. Being able to see both who is invited and who has already joined helps kick off the call smoothly by avoiding extra rounds of “Who’s here?” and “Who are we waiting for?” You don’t have to wonder who said what. We’ve had this unique visual dimension since our launch. Starting today you can also get your own permanent conference URL. 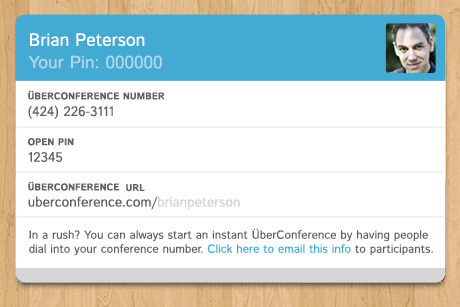 When you log into ÜberConference you will see your ÜberConference URL on your dashboard. It will be a number by default, but you can customize it to be your name or whatever you like. This way it’s easier to remember and share. Click here to login and get your own unique URL now! Thursday, October 4th, 2012 . Tech tastemaker Robert Scoble discusses our easier conference callingplatform with UberConference CEO Craig Walker at TechCrunch Disrupt SF 2012. Tuesday, October 2nd, 2012 . Leadership development consultant John Baldoni conducted a series of experiments over a decade to determine how best to keep everyone’s attention in conference calls. He found there is only one sure meeting killer and that is not involving your participants. Have an agenda. No one likes having meetings just to have a meeting. If you are just touching base that is one thing, but a regularly assigned meeting for meeting’s sake is irritating to most people and can be a complete waste of time and productivity. Have a focus for the meeting before you go into it. This will help everyone get the most out of the meeting. Let everyone have a say. Even if you are in charge of the meeting, and even if you have an agenda in mind, just going on and on and not letting others have a word is just asking them to tune you out. You may also be tuning out some great insights that could help push your idea to the next level. Letting others participate in the conversation is key to keeping their attention. Give participants something to prepare before the meeting.One sure way to involve people and make them feel important is to have them look into something before the meeting. This helps them feel included and gives them something to add to the conversation. Resist the temptation to multi-task. Do not surf the net, read emails or do other things while on the conference call. People can tell, even over the phone, if you are not really paying attention. If you are not present for your own meeting no one else will be either. Drive consensus and decisions. After making sure people have been heard, formulate a plan of action while you are in the meeting. Speak back the important points covered and make sure everyone is on the same page with the next steps. Wrap up with a plan of action. People like to feel like the meeting was productive and their next moves are clear. This will help everyone feel the meeting went well.